Which sounds great in theory, but WhatsApp users are voicing their concerns. It was a surprising move, as WhatsApp has always championed the privacy of their user base, a reputation that has been backed up by moves like the introduction of full end-to-end encryption to the platform earlier this year. But is sharing data with Facebook really that surprising? Facebook makes a fortune from their advertising platforms, which has a hefty amount of targeting options to make sure advertisers reach their intended customers or clients. 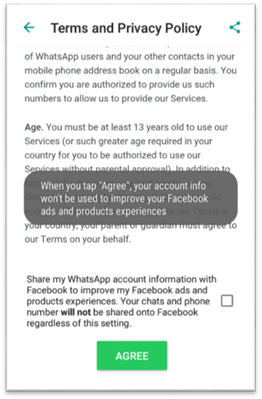 And since Facebook owns WhatsApp, it makes sense that they would look to use any user information to help push more advertising sales. More information = more targeted adverts = more money all round. But it’s not just for the good of businesses, there is a positive spin for the individual as well. Do you know what I hate? Ads. Do you know what I hate even more? Ads that I’m not even remotely interested in. It’s a lose-lose game because advertisers are paying for me to see the ad, but I’m either ignoring it or clicking “Skip Ad”. I’m not interested in clicking on web adverts in general, but seeing adverts that are more suited to me would be less annoying. Ultimately, the more Facebook knows about you, the better they can tailor the platform for you. Whatever your point of view in the matter, there is a way out. If you haven’t agreed to the new terms, you don’t need to. And if you’ve already clicked agreement to the new terms, there is a way to backtrack (provided that you agreed to the terms in the last 30 days). Simply navigate to your WhatsApp settings, click on “Account”, and untick the ”Share my Account Info” box. And you’re done. With the new changes, nobody is quite sure how much information will be shared with Facebook, and naturally people are cautious about their private chat data (text and images) potentially being shared with another party. 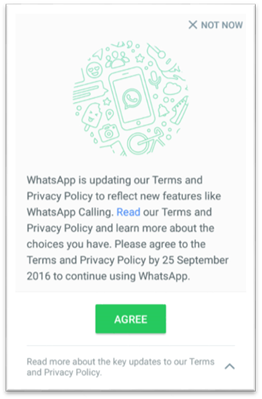 Back in April 2014, a month after the news broke that Facebook would be acquiring WhatsApp, a blog post was published to alleviate some of the concerns that WhatsApp users were mentioning regarding their privacy. In that post, a single sentence stands out, something that many people will be hoping WhatsApp still remembers. “Respect for your privacy is coded into our DNA”.